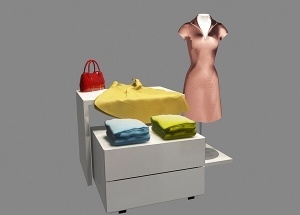 This white clothing display table contacts two parts,the high table and the lower one. It's used to display clothing,dress,pants,shoes,bags. It can be used in women clothing shop,man's shop,kids clothes store,baby shops,shoes and bags shop. It is made by wooden (MDF),with baking finish.